Buddha Garden began in 2000 when Priya took over about an acre and a half of land that was to become the vegetable garden of Siddhartha Farm. 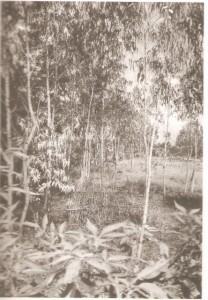 At that time the only vegetation on the land was some rather miserable looking eucalyptus trees and tough grass that was eaten by goats as soon as it grew. The red clay soil was very eroded especially along the several paths that crossed over it. Work began with the building of living spaces for Priya and her two young daughters together with a store room and cycle shed. 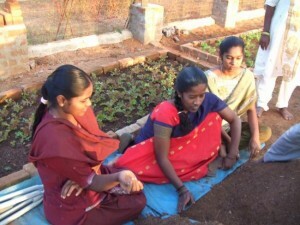 Raised beds were constructed for growing vegetables, on which a drip irrigation system was installed with water coming from the existing well in Siddhartha farm. Soon after Priya set up the garden she was joined by Arjunan, another Aurovilian. Together they did most of the work of growing vegetables. The first year was very difficult as with the poor soil the plants did not grow very well and pests were a constant problem. There were other challenges concerning village relations and how to make the farm financially viable. It was during this year that Priya and Arjunan realised that they could not do all the work themselves and started one of the first volunteer programs on Auroville farms. You can read more about this first year in the book that Priya wrote called How My Garden Grew. 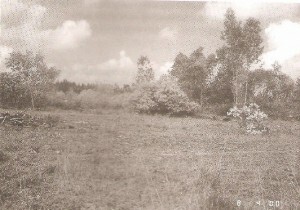 In February 2001 new land around Buddha Garden became available and the farm expanded. Various new developments were undertaken including the building of a proper store room together with two capsules, kitchen and bathroom for volunteers. The first residential volunteers came in May 2001. During September and October of that year the integrated chicken project was set up. This consisted of a chicken house with three yards where the chickens went in rotation with the vegetables. We also planted cashews, an orchard, wood lot and forest on the land that was too poor for agriculture. In January 2002 two more capsules for volunteers were built and the accommodation rearranged to make more space for volunteers. In March 2002 John joined Buddha Garden. A professional farmer from the UK he brought with him a lot of expertise and experience that enabled the farm to become more productive. At his instigation the vegetable garden was changed to make better use of available water with fewer beds being used more intensively. Sharing the water pump with Siddhartha farm was becoming more difficult as there didn’t seem to be enough time to pump all the water that was needed. Buddha Garden therefore purchased a new solar pump and the irrigation system was completely overhauled. In December 2003 Priya left Buddha Garden for a six month break and John took over the farm. He consolidated and improved the production of vegetables and eggs and grew the first field crops of red rice, varaigu and kumbu. The apprenticeship program was started in July 2004. This grew out of a process whereby Buddha Garden became more consciously a place of transformation and experiential education. As well as a place for producing food. The aim of the program was to provide an experiential education for local young people to learn about organic farming. And what it means to live lightly on the land in a spiritually integrated way within Auroville. It was envisaged that they would do this as part of our community of learners which included both the residential and other volunteers in Buddha Garden. The aim of the course was to provide apprentices with skills in organic farming which included both practical and management skills, such as computing and accounts, that are needed to run a successful farm. At the same time they would also participate in a general education course that included learning English and finding out about Auroville. Through discussion and reflection we would also, together, examine the various challenges of living well and how they would like to incorporate these principles in their own lives. From the beginning it was hoped that the volunteers would join in this program by offering to share their passions or skills. Although the program had some successes (You can read a more detailed description of this program and why we had to discontinue it in the section about the apprenticeship program) we decided to discontinue the program in 2006. 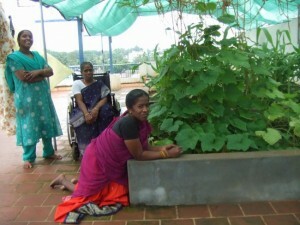 Up until 2005 Priya had been living in Buddha Garden on her own with the part time help of Arjunan. In May 2005 Somasundaram, an Aurovilian, came to live and work in Buddha Garden together with Vivek who over the next four years carried out the fieldwork for his PhD (at the university of Lucknow) in Buddha Garden as well as helping to run the farm. 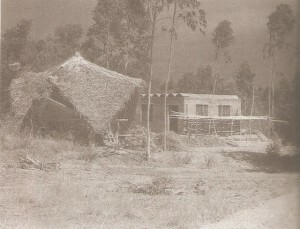 At the end of 2006 Somasundaram decided to move back to Aspiration (another Auroville community) although he continued to be connected with Buddha Garden. For a year or so afterwards he continued to come in every morning to cook the volunteer breakfast. The whole farm was reappraised in the light of our resources of energy and finance and a number of things planted that require less intensive care. These include bananas, papaya and more cashew trees and casuarinas for their nuts and wood respectively. 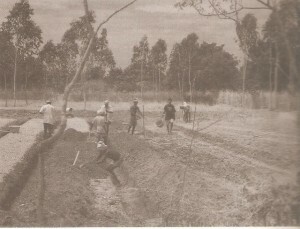 Although the cashew trees survived the casuarinas did not as their fields were flooded soon after they were planted. During 2007 Pierre came to Buddha Garden as a Newcomer, becoming an Aurovilian in 2009. From this time our educational activities continued to grow. We found ourselves hosting many students on various educational programs as well as putting on a course for girls from the Rajiv Gandhi Home for Disabled Girls in Puducherry. The rooftop garden on the top of the Rajiv Ghandhi home building which was created and maintained by residents. In May 2009 we opened the Centre for Sustainable Farming which is a centre for information and research about sustainable/organic agriculture for Aurovilian and local farmers/food growers. We also started a weekly ‘Introduction to Sustainable Farming’ workshop which continues. As well as creating courses tailored to a wide range of participants – from individuals wanting to grow some of their own food at home to professional farmers and researchers. We also continue to host school and student groups. We have helped a number of research students from universities around the world with carrying out a number of research projects. During 2010 Buddha Garden received a grant from the Auroville community to develop the farm. We used the money to build more brick raised beds and to create an infrastructure that makes it easy for those will little experience to carry out the necessary tasks. It has helped us increase our production by 50%. We also built an internal fence to protect our valuable vegetable crops from increasing numbers of cows coming on the land and have taken over a small new piece of land which we have fenced and on which we planted a range of forest and fruit trees. In the last three years we have developed an area of Buddha Garden which we call Jalabhoomi or ‘land of water’. Here we have, with the help of Kireet, created three water catchment ponds as well as planting a lot of forest trees. We have also completely refurbished the fence around the perimeter of Buddha Garden so the whole place is now cow proof. In the last few months of 2015 we have created an area of Buddha Garden, called Shambala, for which Pierre is individually responsible. He has set up a large nursery and vegetable beds where he plans to grow lettuce, roccolla and other crops that he will process as part of his ‘Taste of Nature’ activity. We have created Pryog orchard at the back of Pryog garden. Here there is a wide variety of fruit trees and information boards so that people can come in and learn about the food producing trees in this area. At the beginning of 2016 we are in the process of setting up a series of activities which we are calling ‘Earth to Eating’. This is an educational program which will explore the growing and preparing of local food in Auroville. Buddha Garden is a vibrant and constantly evolving place and all of us who are now involved – Priya, Vivek, Pierre, Sivakala, Rajan – feel that we are evolving with it. For all of us who live here the practical and other work that we do in Buddha Garden is part of our spiritual practice and important part of our growth. We love to share this experience and opportunity with other people who we hope will be inspired in their own development and growth.